The Herb Spiral has become something of an icon for Permaculture gardening techniques. This is primarily because it is an attractive and easily reproducible way of very clearly demonstrating several of the principles of Permaculture. While there are some amazing things being done in this sphere, from Greening the Desert to Regenerative Agriculture, these are not necessarily relevant to a small back garden in England! An herb spiral, however, is entirely relevant, and very practical. Fresh herbs are wonderful for their culinary uses but they can also offer medicinal benefits, like calming chamomile, or feverfew for headaches. The aromatic herbs also confuse pests and attract beneficial insects, and provide a wonderful, sensory experience for us. Late Spring/early Summer is the perfect time for this project, as you can incorporate frost tender plants such as basil and coriander into your design to enjoy over the summer. The basic herb spiral design is a rising cone-shaped spiral incorporating multiple levels (like a little herby helter-skelter!) 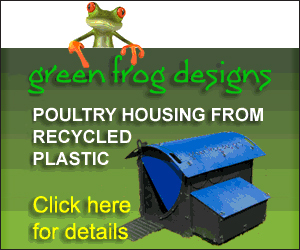 This design creates different growing environments, or microclimates, in a confined space. It should be large enough to comfortable accommodate several herb plants with room for them to grow on. Something around 5 or 6 feet in diameter and around 3 feet high should be ideal, although this can be adjusted to suit your available space. Remember to make sure that plants in the centre can be accessed easily as you don’t want to be clambering all over your masterpiece when you need a sprig of thyme. Location is important – preferably site your herb spiral close to the house. Put your spiral in as much sun as possible: anything planted on the South-facing side will get plenty of sun, whereas those plants behind the spiral will be in the shade. When it rains, water flows down through the soil, meaning the soil at the bottom of the spiral will be more moist than the upper levels. Your herbs need to be located to take advantage of these varying conditions – plants like rosemary and sage that prefer a sunny position and well-drained soil, are planted at the top. At the bottom are herbs such as lemon balm and mints, which need plenty of water, and will benefit from the shade provided by the plants higher up the spiral. In between, planted according to their needs, will be plants such as thyme, parsley, coriander and basil, whose requirements will vary. 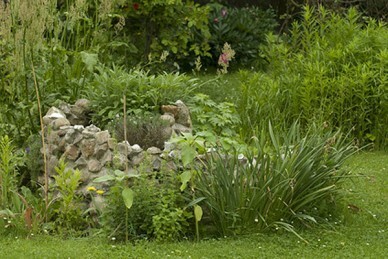 A well-planted herb spiral should be largely self-maintaining, with only a little weeding and trimming here and there. Don’t forget that a lot of ‘weeds’ are very nutritionally-dense edible plants, so try to view a stray dandelion or hairy bittercress as a gift, rather than a curse. It’s not just herbs either, you can plant any easily-grown plants as long as they are not going too vigorous growing. Some good options are strawberries, garlic, lettuce, and radishes. And why not use the vertical space even more efficiently by growing some climbing peas or beans towards the back of the spiral? The purpose of an herb spiral is not just to grow plants, or to have an attractive focal point in the garden. The most important thing we can learn from this lovely feature, really, is the application of thoughtful design. Ongoing observation and evaluation is essential. If, for example, you notice that the chives on the North-East area are doing better than those on the West side, you can shuffle things around accordingly. Paying attention to patterns such as this, and responding to them, helps us to make us make more informed decisions in future. A thoughtfully-designed herb spiral utilises gravity for efficient irrigation, maximises the sun’s energy and uses shade to reduce evaporation where required, amending the soil and creating microclimates for a variety of plants to be grown. And all that stone absorbs the sun’s warmth during the day, then releases it during the night to keep the soil warm. So although a herb spiral may seem like it is a world away from greening the desert, there are in fact a number of definite similarities, as both systems are based on the same design framework. The basic technique is to lay down your cardboard, build your spiral structure with your stone/bricks etc, fill it with your soil, then put in your plants.